As a car manufacturer and modifier, Siata had some pretty high points. They produced some achingly beautiful cars, and did many of the same things as Abarth. Unfortunately, the Spring was not one of the high points. Based on the Fiat 850, with misproportioned pseudo-1930s styling, Siata somehow thought they were building a car that would appeal to young people. Would you believe the front end was styled by Enrico Fumia, the same man responsible for the design of the Alfa Romeo 164? And that raises an interesting question – the car’s ends look like they were styled by two different people. Nonetheless, if you want a 1930s replicar, but the Alfa Romeo Quattroruote is too pricey, and the Beetle-based pseudo-Alfas and Bugattis are just too pedestrian for you, maybe this will do the trick. 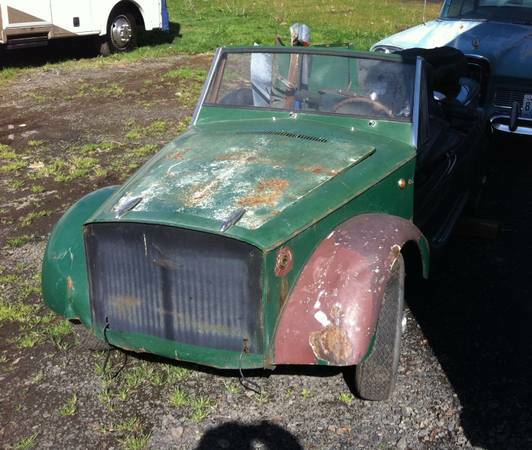 Check out this 1970 Siata Spring for sale for $3000 in Dayton, OR. No, that’s not a typo – the fine settlers of Oregon seemed strongly inclined towards recycling names of towns found elsewhere in the US, like Salem, Portland, Milwaukie, and more. As you can see, this car has been carefully stored in a well-ventilated area, and all the parts have been lovingly stowed inside the passenger compartment to avoid further damage. 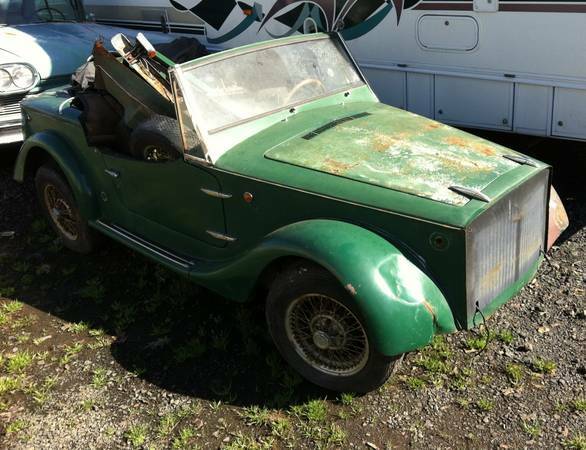 The engine is said to be disassembled, and the block to have been tanked, but other than that it looks to be a great opportunity for those wanting to do a ground-up build, particularly if you enjoy spending your time hunting for obscure trim parts. Unfortunately, a ding on the right front fender detracts from the otherwise excellent condition. Judging by that left front tire, the car has not turned a wheel since the 1970s. You could start off on the mechanical bits – those are easily available since they’re shared with the 850 – and if you’re lucky, there’s not a tremendous amount of rust on this one. It would certainly get plenty of attention, but so does an Excalibur. Perhaps the most fun you could have with this is to throw some standard 850 modifications at it – it might be a good laugh to do an Abarth Spring! This entry was posted on March 18, 2015 at 5:05 pm and is filed under Feature. You can follow any responses to this entry through the RSS 2.0 feed. You can leave a response, or trackback from your own site. Mentioning “style” in the header ten showing these pictures was quite the conundrum. Any chance you would want to sell the grille if it’s available?